With Mother's Day right around the corner, there isn't a better time to think about a little relaxation and pampering for all of the moms out there. No matter if you stay at home, work at home, work outside of the home or have kids that are all grown up, we all deserve at least one day of putting our feet up and having someone else do all the work (we actually deserve much more than just one day, but that's a whole separate issue). And when it comes to treating our skin with the best possible products out there, there's no need to look any further than the top of the line collection available at Votre Vu. 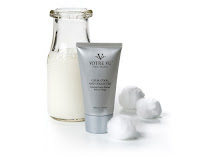 French-made and containing only the finest natural ingredients available, Votre Vu products are hand-crafted with a large proportion of power ingredients within in each formula. 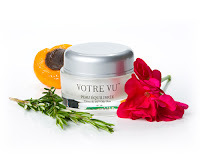 In comparison to many skin care products that are comprised of primarily fillers, Votre Vu's higher percentages ensure that they are only produce superior products that give superior results! With a large collection of amazing products, I like that Votre Vu has something for every age and skin type. Sensitive skin? Troubled skin? Mature skin? There is something formulated just for you. With my normal to oily skin, I was able to try a great 3-step combination to help me cleanse, tone and and balance consisting of the CALM, COOL, AND COLLECTED Calming Cotton Masque Pour Le Visage, the PEAU ÉQUILIBRÉE Tonic for Oily Skin and the PEAU ÉQUILIBRÉE Crème de 24/7 Oily Skin. Step 1: Using the 3 C's Cotton Masque for Calming Skin, I smoothed a layer on my face and let it sit for 15 minutes while I enjoyed the sweet, flowery scent. The Masque felt smooth and soft on my skin, not rough or drying like others that I've tried. Step 2: I felt a little odd spraying myself in the face with the Balanced Skin Toner, but liked knowing that it was balancing and purifying my skin. Step 3: I applied a light layer of the Balanced Skin Crème and was amazed to find that my skin felt clean and clear without being stripped of all moisture. It was like a mini trip to the spa all in the comfort of my own home. So as not to leave out the rest of my skin, I also tried the Tarte D'Amande Hand Crème, one half of Votre Vu's DUETTE LUXE LIP BALM & HAND CRÈME (an innovative double-bottle that contains both a hand cream and a lip balm). 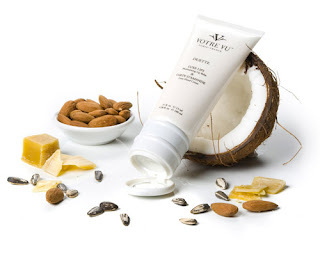 This lotion is luxuriously thick and the strong smell of coconut stays with you long after you have massaged it in. I really liked the way it absorbed into my skin but didn't leave my hands feeling greasy or sticky but instead left them fully hydrated with a soft glow. 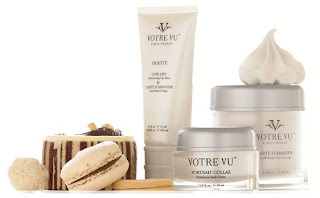 After having tried Votre Vu's products, I can see why everyone loves them! Their high quality combined with the fact that they do not test any of their products on animals has made a big fan. To find out more, as well as to read up on some great articles on beauty, fashion and health, visit Beauty Bambina. 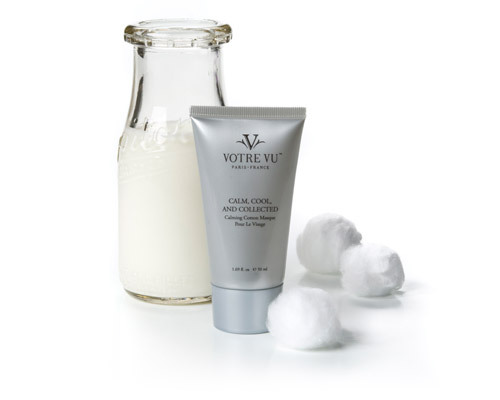 Plus, you can find information on where to go to order Votre Vu items online or by calling 866-52-ORDER to speak to a consultant. One lucky person will win a DUETTE LUXE LIP BALM & HAND CRÈME! ARV $38! To enter to win: Visit Votre Vu, browse their wonderful selection of products and tell me which one(s) you would like to own. 1 Extra Entry (per method) if you follow Beauty Bambina on Twitter and/or subscribe to Beauty Bambina's feed. 3 Extra Entries if you blog about this giveaway linking back to Thanks, Mail Carrier and Beauty Bambina. Please leave an address where it can be found. A big thank you to Barbara from Beauty Bambina for providing Votre Vu products for me as well as a DUETTE LUXE LIP BALM & HAND CRÈME for one lucky giveaway winner. This review was made possible due to my membershipo at The Product Review Place. The opinions shared are my own and honest and if you really need to see more, click here to see how I roll. I would love the "Creme de Jour Dry Skin"
I NEED the creme du jour dry skin! My skin is the worst and it's dry no matter the season. I really need the lip balm for my dry lips and the creme du jour for my very dry skin! I would love to own "Flowers for her Face". Not an entry as I am from Canada. Just visiting from FF. Am your newest follower. I entered your Cascadian Farms giveaway! I entered your Kinesys giveaway! I entered your Yoplait Greek giveaway! I've entered your Oster Blender giveaway. I've entered your cleanwave wand giveaway. I've entered your Digital Kitchen scale giveaway. I've entered your inner goddess goodies giveaway. I've entered your Princes Couture Designs giveaway. I would love to try the ROYAL TREATMENT Gentle Pearls Face Scrub. The Attentive Base Face Regimen Set looks wonderful! I entered your Princess Couture giveaway. I like the CHEVEUX HEUREUX Shampoo Riche. I would love to have the Peau Équilibrée Base Face Regimen Set. I would love to try the ROYAL TREATMENT Gentle Pearls Scrub Pour Le Visage. I entered the Verilux cleanwave giveaway. I follow Bambina on Twitter. I'd like to try the Your Highness bust firming product. I would love to try Peau Equilibree for Oily Skin! Following Beauty Bambina on Twitter as hybroanglid. I entered Wholesale Keychains giveaway. Regimen Set would be awesome. The Creme de Jour Dry Skin looks awesome!